“It Rules…surprisingly badass.” — Exclaim! Demented Punk unveiled the “Weird Al” Yankovic cover of “Beat On The Brat” originally recorded by the Ramones and released on their self-titled debut album in 1976. 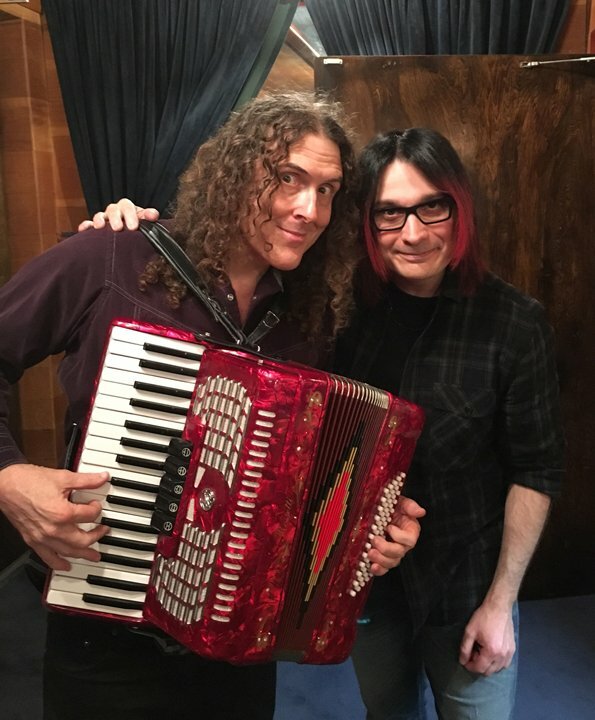 “Weird Al” contributed his iconic vocals and accordion to the punk-pop track, backed by Osaka Popstar, which features John Cafiero singing the answer backs in between Al’s lead vocals, drums by Dennis Diken (The Smithereens), bass guitar by Sal Maida (Roxy Music, Milk ‘n’ Cookies) and guitar by Dean Rispler (Dictators, Voluptuous Horror of Karen Black). 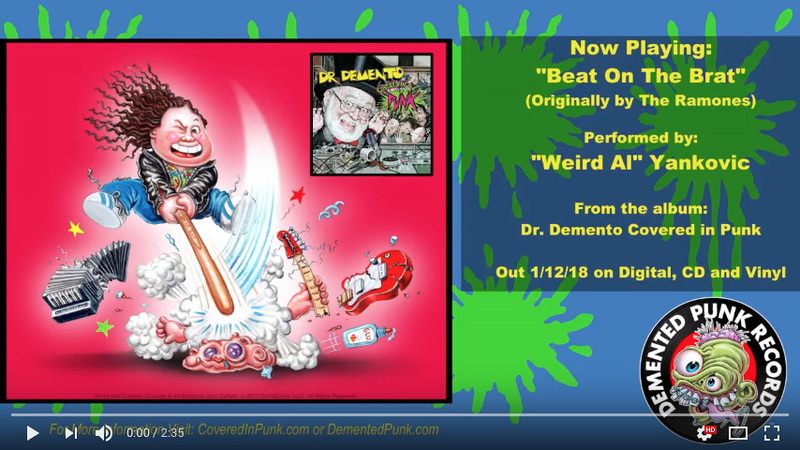 “Beat On The Brat” appears on Demented Punk’s Dr. Demento Covered In Punk which is due for release on January 12, 2018. This audio oddity is a modern-day homage to radio icon Dr. Demento, a world-renowned institution who has championed novelty music and its creators since the 1970s. Dr. Demento Covered In Punk is a special two-hour demented punk extravaganza, structured like one of Demento’s original radio shows. The collection features an eclectic mix of artists from the world of classic and contemporary punk/indie/alt-rock, along with special guest stars from film, TV and more. “Beat On The Brat” is available now as an instant grat track to fans who preorder the physical album HERE and those who preorder it digitally from iTunes. It can also be previewed HERE. “Beat On The Brat” features original Garbage Pail Kids inspired artwork by none other than Neil Camera, artist for Topps’ Garbage Pail Kids, Wacky Packages and Mars Attacks cards and sticker sets. 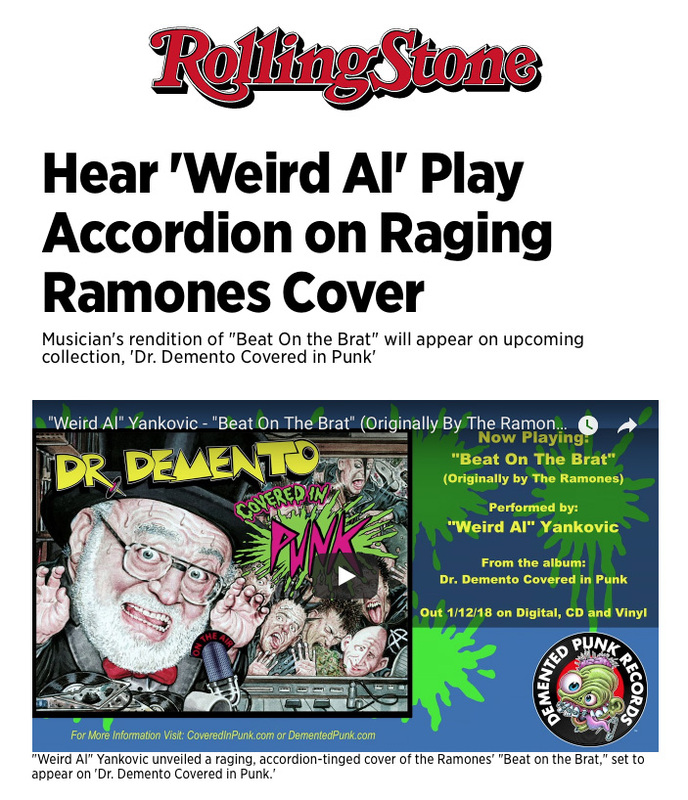 Dr. Demento Covered In Punk features over thirty different, never before released, all-new ‘punk’ cover versions of ‘mad music and crazy comedy’ songs famously heard on the airwaves of the legendary “Dr. Demento Show”— intermixed with ‘wild card’ tracks showcasing some incredible, newly ‘demented’ versions of punk-rock classics! Joined by everyone from the Misfits, Joan Jett, Fred Schneider of the B52s, to “Weird Al” Yankovic, the late Adam “Batman” West (in one of his final performances), and Captain Kirk himself, William Shatner—(to name just a few). The Doctor is in…and he’s ‘Covered in Punk’!! A full track listing can be found HERE. created exclusively for the project by a team of visual artists spanning the world of comic books, classic punk rock album covers, Topps trading cards series, Mad Magazine and More. The cover artwork for the album was created by iconic illustrator Drew Friedman whose work has appeared in countless publications from Entertainment Weekly and Time Magazine to Rolling Stone and the New Republic and just about everything in between. “Weird Al” Yankovic and Osaka Popstar’s and “Dr. Demento Covered In Punk” producer John Cafiero. Click above to visit Demented Punk on YouTube and stream “Beat on the Brat” now! Visit the ‘Covered in Punk’ Official Website for full details including the complete track list and artist line-up. Follow the release on Facebook and Twitter for more. Click the Demented Punk logo below to PRE-ORDER now, look for the online exclusive variant vinyl Ltd to 500 pcs worldwide, and bundle with Ltd bonus poster—while supplies last. All Vinyl and CD pre-orders include instant MP3 download of “Beat on the Brat” by “Weird Al” AND “Garbageman” by William Shatner! Click to read the feature at Rolling Stone.com for more.